Afternoon open event in the amphitheater integrated into the new Debrecen stadium gathered several thousand people yesterday. The northern Nagyerdei Park was invaded by curious citizens who have spent the last decade hearing about plans of a new stadium and finally have it ready for use. As the evening event unveiled inside the stadium, stands were packed to capacity, meaning a 20,000-strong crowd. The idea of a new stadium for successful DVSC football club had been raised from early 2000’s, but only came to fruition in 2011, when a public company to build the stadium was established. 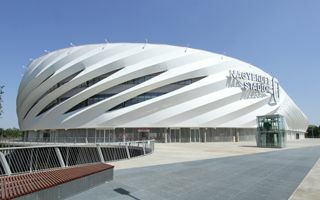 Official design was selected in 2012, while January 29 2013 saw the beginning of the old Nagyerdei Stadion’s demolition. From there it went really fast, even though some challenges came along the way. The scheme included retaining the historical stadium gate with set of sculptures from the original 1934 stadium. Also challenging for contractors, the stadium was set to keep the surrounding trees, even though some of them were directly inside the construction site. But despite these challenges delivery date of spring 2014 was kept and the HUF 12.5 billion (€40.6m / $56m) stadium was opened on May 1 2014. The 14-month construction went almost flawlessly, but a sad accident happened last Saturday. A worker running checks on the roof fell to his death. Though incidents like these aren’t uncommon in big projects, this time it seemed the most dangerous part was over. This didn’t stop the opening and now stands accommodating just over 20,000 are open. They create a single tier enclosing the pitch from all sides, though their height differs, decreasing smoothly from west to the east. The tallest western grandstand provides press facilities and all of the corporate zones with 26 skyboxes. North and south ends provide two separate fanatic sections, southern for home fans and northern for the away contingents. In both cases rail seating was used, allowing fans to stand throughout the game. From the outside the stadium is wrapped with diagonal membrane strips. In western part the wrap has numerous orifices to enable sunlight access for offices and hospitality spaces behind the membrane. Stands are accessible from an elevated esplanade around the stadium. Access to the esplanade in turn is provided by a set of impressively located ramps erected between the trees. Direct surroundings were created as a friendly park space with an amphitheater, gardens and bicycle tracks, among other. Though opened, the stadium is yet to see its first football game. That scheduled for May 10, against Újpest, is selling very fast with hundreds of fans queuing at the new ground’s ticket offices. This should be the first serious test of Nagyerdei Stadion’s football experience.